DENVER – The Wild has just one more game to play before it’ll embark on an eight-day break in the schedule, but this final test is significant since it’s against a Central Division rival in the Avalanche that’s only a point shy of the Wild in the standings. This is the Wild’s final trip to Colorado during the regular season, but it’ll host the Avalanche one more time – a matchup that could help decide seeding for both. 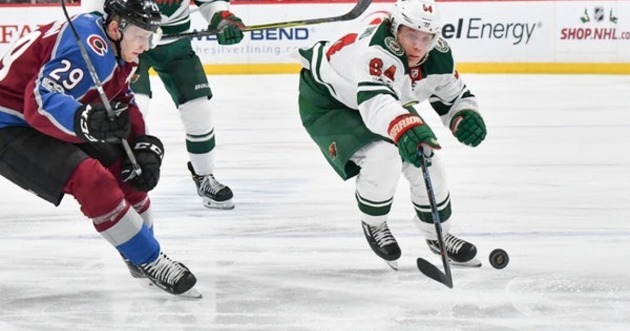 After the Wild fell 4-1 at Pepsi Center in its season-opener, the team held off the Avalanche 3-2 at Xcel Energy Center Oct.27. Overall, the Wild has lost its last four meetings in Colorado. Defenseman Brad Hunt will make his Wild debut after getting added in a trade Monday. He’ll play on the left side, while Jonas Brodin will shift to the right. The plan is for Brodin to pair with Greg Pateryn on defensive-zone draws, a rotation the Wild used previously when Louie Belpedio was with the team. Center Eric Fehr remains out, but Boudreau believes Fehr’s lower-body injury will be healed after the break. “He’s close right now,” Boudreau said. 19: Goals surrendered by the Wild in its last four visits to Denver. 64: Saves on 67 shots for goalie Devan Dubnyk over his last three games. 9: Points for defenseman Jared Spurgeon in his last 11 games. 8: Multi-point games this season for center Eric Staal. 7: Hits Monday for winger Jason Zucker. Colorado has gone 2-5 in its last seven games. The team is coming off a 4-1 loss to the Predators Monday that enabled the Wild to leapfrog the Avalanche in the standings with its win over Vegas. Still, the Avalanche boasts one of the most dynamic lines in hockey with Nathan MacKinnon, Gabriel Landeskog and Mikko Rantanen. The three has combined for 197 points, the second most of any three teammates this season. Rantanen’s 73 points before the All-Star Game are an Avalanche record.